American baseball superstar Alex Rodriguez won three MVP awards and hit nearly 700 home runs over his 22-year career, but saw his reputation tainted through his link to performance-enhancing drugs. In 2001, Rodriguez signed the most lucrative contract in baseball history when he inked a 10-year, $252 million deal with the Texas Rangers. He arguably proved he was worth every penny, leading the American League in home runs for three consecutive years and winning the MVP award in 2003, but the team around him never took off like he’d hoped. Following the 2003 season, he was traded to the New York Yankees, even agreeing to move to third base. In New York, Rodriguez continued to post big numbers. He won another MVP award in 2005 after hitting .321 with 48 home runs, and delivered a monster season for the ages in 2007, topping the Majors with 54 homers, 156 RBIs and 143 runs to snag a third MVP trophy. That same year, on August 4, at age 32, he became the youngest player to hit 500 career home runs. Following a brief pregame ceremony on August 12, Rodriguez donned the Yankee pinstripes for one final time as a player, contributing an RBI double in the first inning to help his team win. While he never reached the record-shattering heights that once seemed attainable, the slugger still finished with numbers that rank among the best ever in several categories, including home runs (696), RBIs (2,086), hits (3,115) and runs (2,021). Along with his three MVP awards, he won two Gold Gloves for his fielding prowess and was selected for 14 All-Star Games. Rodriguez married Cynthia Scurtis in 2002. They have two children — Natasha (born 2004) and Ella (born 2008). The couple divorced in 2008. Rodriguez has reportedly dated various celebrities including Madonna, Kate Hudson, Cameron Diaz and, most recently, Jennifer Lopez. 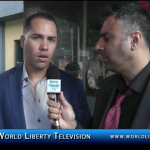 Arod was honored at the Sports Legends Award 2018, his girlfriend Jennifer Lopez (JLO) ,was in attendance, see more about Sports Greats in our World Liberty TV Sports Channel and Blogs by Clicking here.